Arcturian Ascension Tools: Who Are The Galactics? I’d like to repost this series from 2012, introducing our star family to whet our appetites. I didn’t find any passages that I’d change. They’re enlightened beings from distant star systems who originally seeded the Earth and are here now to reunite with their progeny. It is they who disarmed the military-industrial complex which controlled our planet and created advanced weapons systems with an eye to ensuring their dominance. What transformation is this? It’s the Ascension or shift in consciousness that we described in the last chapter. These advanced ancestors of the human race are human like us, appear like us, although others who are also here do not look like us. All are ascended spiritual beings who are only here to assist us with our Ascension, which is in progress. We’ve been led to believe that we’re the only life forms in the universe, but SaLuSa of Sirius tells us that nothing could be further from the truth. The galactics bend the knee to this “mighty intelligence,” just as we do, and follow its laws and commandments much more closely than we. Apparently, the human form, called the Adam/Eve Kadmon template, is common in the universe, as we’ll discuss later in our story. The present human race or species, the one that succeeded Cro-Magnon man, is extraterrestrial in origin and angelic in nature. But we descended into form as an experiment and don’t remember our divine origins. I’ll let SaLuSa and Archangel Michael explain. SaLuSa tells us that we’re as much extraterrestrial as any of them are. 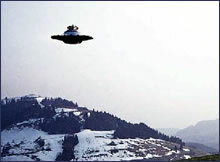 UFO fleets have appeared above London, New York, Lima, Mexico City and many other cities. But SaLuSa is only talking about the “recent” past. Archangel Michael goes much further back in the evolutionary cycle and reports that we’re angelic in origin. Please keep in mind that we are eternal souls. If you think that we live only one life, well, it’s time to let that view of us go. It’s too restricted to help us understand what Archangel Michael says here. SaLuSa supports Archangel Michael’s contention, He calls us “angels,” “gods” and “beings of light.” These are all synonyms. “We know that some of you feel uneasy at that suggestion, and the reason is likely to be because you still feel inadequate to be considered gods. Bear in mind that before you came into duality all of you were gods, and as Beings of Light were amongst the great creators in the Universe. (2) The Arcturians in Arcturian Ascension, Sept. 13, 2008, at http://tinyurl.com/2vllxtr. 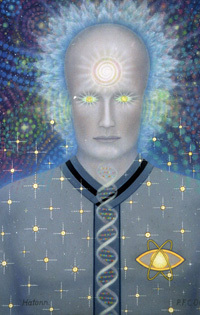 (3) SaLuSa, Sept. 23, 2009, at http://www.treeofthegoldenlight.com/First_Contact/Channeled_Messages_by_Mike_Quinsey.htm. (4) SaLuSa, Oct. 1, 2012. (5) Archangel Michael, An Hour with an Angel, March 26, 2012, at http://the2012scenario.com/2012/03/archangels-michael-and-gabriel-on-the-angelic-realm-hour-with-an-angel-transcript-march-26-2012/. Archangels, principalities, dominions, and virtues are all orders of angels. (7) SaLuSa, Nov. 2, 2011. SaLuSa explains that our physical form was introduced into Earth after Cro-Magnon man, as a special experiment. “You do not exist by some freak of nature, and are not the result of natural selection, but purposefully and lovingly created to exist in your environment. Extraterrestrials like Quetzcoatal, an incarnation of Sanat Kumara of Venus, were viewed as gods by less developed civilizations. The most advanced of the galactic civilizations are far above such considerations because they inhabit light bodies and are not attached to locales as we are. According to Ker-On of Venus, the dark forces in control of this planet represented the idea of contact with “aliens” as opening the door to a hostile takeover. Their present mission could be said to have started during World War II, when terrestrials exploded nuclear bombs which wreaked havoc with Gaia and inter-dimensional space. That mission increased after the Harmonic Convergence. That event was the world’s first globally-synchronized meditation and occurred on August 16–17, 1987. The Galactics won’t violate our freewill unless it conflicts with a higher-dimensional being’s, like Gaia’s. There are actually several reasons why they’re here. Besides curtailing our use of nuclear weapons, another reason was respond to Gaia’s cries for assistance. They saved her from planetary death from the effects of world wars, radiation, pollution, and depletion. Agartha is the Inner or Hollow Earth, where the survivors of Lemuria went and prospered. So rather than Alien or Predator, this is who’s here. This is who’s coming to dinner and we’re not the catch of the day. Who’s coming is family, our ancestors from the stars, come to our graduation party. After that, it’s up to us. Some may return home with them and some may continue here and build the new world. (8) SaLuSa, Aug. 25, 2010, at http://www.treeofthegoldenlight.com/First_Contact/Channeled_Messages_by_Mike_Quinsey.htm. (9) SaLuSa, March 27, 2009. (11) Adamu, “Adamu Speaks,” 7 Sept. 2008, at http://book-of-light.com/forums2/viewtopic.php?f=43&t=81. (12) SaLuSa of Sirius, 27 Oct. 2008. (13) SaLuSa, March 18, 2009. (14) SaLuSa of Sirius, March 23, 2009. (15) SaLuSa of Sirius, Dec. 15, 2008. (16) Many sources make the statement that they are enlightened, ascended, or more evolved and advanced than us. For instance, see SaLuSa of Sirius, March 18, Apr. 3, and May 4, 2009; Ker-On of Venus, 3 July 2009, at http://www.treeofthegoldenlight.com/First_Contact/Channeled_Messages_by_Mike_Quinsey.htm; Tom Kenyon, “Who are the Hathors?” at http://tomkenyon.com/who-are-the-hathors/; Adamu, 31 Aug. 2008, at http://book-of-light.com/forums2/viewtopic.php?f=43&t=81. 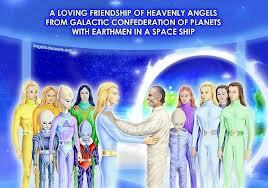 (17) Spiritual Hierarchy and Galactic Federation, Update, May 7, 2002, ibid, at http://paoweb.com. 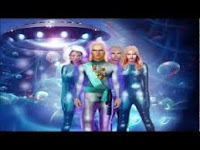 (18) Spiritual Hierarchy and Galactic Federation (SHGF), Update, through Sheldan Nidle, Dec. 2, 2008, at http://www.paoweb.com/sn120208.htm and Ker-On, March 4, 2009, at http://www.treeofthegoldenlight.com/First_Contact/Channeled_Messages_by_Mike_Quinsey.htm. (19) SaLuSa of Sirius, Dec. 15, 2008. (20) Ker-On of Venus, Oct. 22, 2008.